It can’t all be business with me, folks. Especially not this time of year. So, for now I will lay aside my ABC’s of Business series and dive head-first into the season of Glühwein, Plätzchen, Christmas Markets and goody-stuffed boots. Two cultures, so many holiday traditions, and so little time. Time’s a-wastin’ already. Ready, set…go! Saturday of last week marked the kick off my favorite time of the year. The time of year where I milk two cultures’ worth of traditions for all they’re worth. This post will be a symphony in three parts; this week is, logically enough, Part I. This was the day the Diehl household celebrated Thanksgiving, seeing as Thursday is just a normal work and school day for everyone in this part of the world. I pride myself on having been through this drill enough now to know how to time my preparations. Bird was diligently ordered the previous week. I had taken care to specify the weight. I went to pick it up, and– as they tend to do with me every year– the Germans threw me a curveball. I get it; Germans do geese, not turkeys. Requests for fresh turkeys throw them for a loop. Which explains why they threw me for one right back by wheeling out a 35-pounder roughly the size of a small pickup truck and three times the size of what I had ordered. After picking my jaw up off the floor, I concocted a Plan B, waved off the ill-fated fowl and hit the freezer section. I found a turkey that would actually fit in our oven and rushed home to put togther what I hoped wouldn’t be a disasterous meal. Disaster averted! 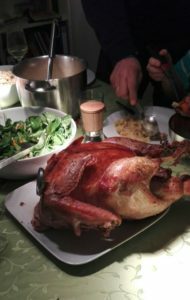 This bird went from frozen solid to table-ready in six hours. Whew! Though the town had been teasing us all week by stringing up lights and hauling in the familiar log cabin-like huts throughout the pedestrian street, it only became official on November 26: the annual Christmas and New Year’s Market opened for festive business. As per tradition, my boy and I strolled in at dusk yesterday for the inaugural crepe with nutella. 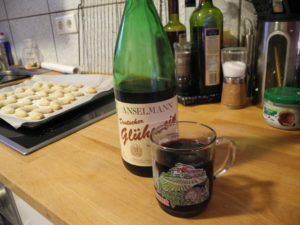 I skipped the market hot mulled wine (“Glühwein”) since we already have an opened bottle at home to be finished first. Fun fact: I nipped my first sip of Glühwein years ago in Austria, when I was still underage by US standards but well of age by European ones. Anyhow, I hated the stuff and vowed to never get within a 10-mile radius of a cup ever again. Nowadays I do enjoy it in the holiday season, but my taste for it is time-limited between November-January. There really is a time and a place for sweet-spicy-warm-winey beverages. My family has made a tradition of visiting Europa Park in Rust during the holiday season. Winter may not be an obvious time to hit an amusment park, but this one does a great job of turning its sprawling area into a winter wonderland (replete with Christmas markets and ice skating rinks). The first year we went, it even snowed for good measure! 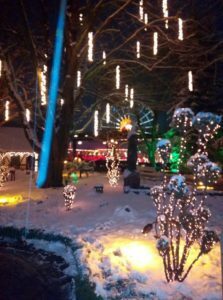 A wintry visit to the amusement park has become a favorite family tradition. I reckon this will be the day to whip up our first batch of Plätzchen (Christmas cookies). I embrace American favorites such as Peanut Butter Blossoms. My very German girl will work her baking magic with jam-filled traditional German treats. I am starting to salivate, so I best bring Part I to a close. Next week: did Nikolaus or Knecht Ruprecht pay us a visit? Did it snow in Europa Park? Have we settled on a Christmas menu? Stay tuned! 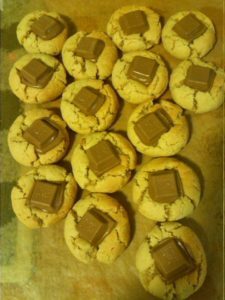 I leave you with American Peanut Butter Blossoms with a German twist. Just switch out kisses for chocolate squares! What are your favorite pre-Christmas traditions? Drop a comment and let me know! Time to start thinking about those New Year’s Resolutions for 2019. Why not make this the year you book yourself and Intercultural Training? Give me a holler and we’ll set up some training dates!